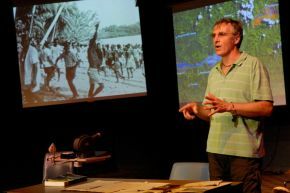 Writer, academic and performer Paul Dwyer retraces three journeys made by his father, Dr Allan Dwyer, a world-renowned orthopaedic surgeon, who visited the region of Bougainville (Papua New Guinea) during the 1960s, healing dozens of crippled children. Family stories become entwined with the larger narrative of Australia’s colonial enterprise in the years following: the opening of a giant copper mine, environmental devastation and Bougainvillean resistance. This intimate ‘performance lecture’—combining archival video and Kodachrome slides, diaries, letters, ethnographic fieldnotes and a crash-course in Pidgin English—highlights the moral and ethical commitments binding Australians and the people of Bougainville in the wake of a brutal civil war that cost up to 20,000 lives. Politics and performance at their most personal.